GALIANO ISLAND, B.C. — Quiet beach walks: Check. Hikes through old-growth forests: Check. Whales and wild deer: Check. 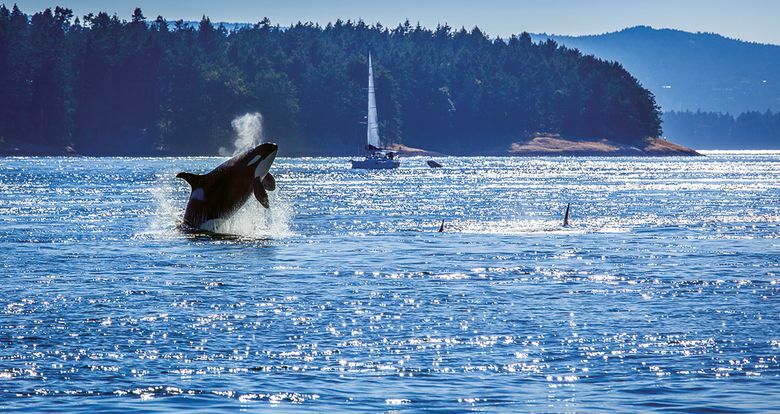 Mix the usual island pleasures with a dose of serendipity — as in who knew we’d find ourselves on a bus filled with passengers shaking maracas and singing Beatles tunes — and it’s easy to fill a weekend exploring British Columbia’s tiny Galiano Island, which dubs itself the Gem of the Salish Sea. One of the least-developed of Canada’s Southern Gulf Islands between Vancouver Island and B.C.’s lower mainland, Galiano is just 17 miles long and 3.7 miles across at its widest point. Just an hour’s ferry ride from the mainland, Galiano could be an easy day trip, but my husband, Tom, and I found plenty of reasons to settle in, starting with the peach-and-raspberry scones from the Sturdies Bay Bakery and Cafe, down the hill from our Airbnb, a three-room cottage close to the ferry dock. Our host, Alexandra, pointed out the location of a Saturday farmers market at the end of her street, and several hikes and walks we could take from her front door. With half the island used as a tree farm by the lumber industry until the early 1990s, almost one-fifth is protected land, most of it open for public use. “It’s acceptable to hitchhike,” Alexandra told us. “The locals will pick you up.” Perhaps, but much better to bring a car, we concluded, given the mountainous geography and abundance of forest trails. Using a Galiano Parks and Recreation Commission map we picked up at a kiosk next to the ferry dock, we followed dozens of numbered access points to well-maintained beach and bluff trails, with time out for visits with artists, farmers and the world’s most entertaining bus driver. 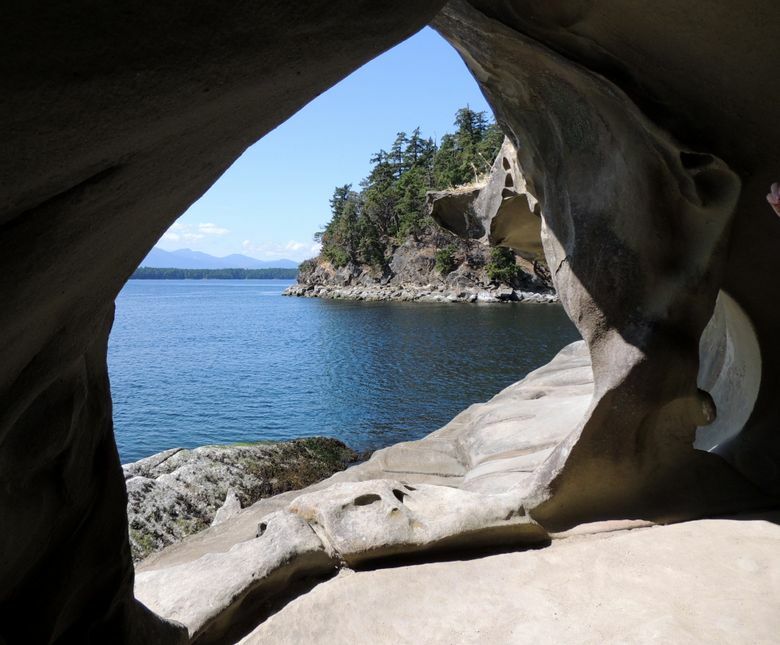 Most visitors find their way mid-island to Bodega Ridge Provincial Park, known for its cliffside trails and views over the Gulf islands and the Olympic Mountains. Nearby, off Porlier Pass Road, are two lesser-known sites and the studios of two well-known artists. Reachable on foot are small sandstone caves at Retreat Cove (No. 31 on the map). We parked, and followed a path to the water, heeding a sign that said “Access to caves at your own risk.” It also noted we were on private property, not unusual on Galiano where trails often border or go through private, residential land. Easy to miss is the small sign off Porlier Pass for Tapovan Peace Park, 200 acres of forested land dedicated to the life of Sri Chinmoy, an Indian spiritual leader dedicated to world peace. The Sanskrit word “tapovan” is a forest or wilderness for spiritual practice, according to a Galiano Trails Society map we found at the entrance. A steep, half-hour walk up a series of stone steps led us to a bluff overlooking Trincomali Channel and a statue of Sri Chinmoy. Hidden in a grove of cedar trees just north of the park are the galleries of potter Sandra Dolph and glass artist DeVicque. 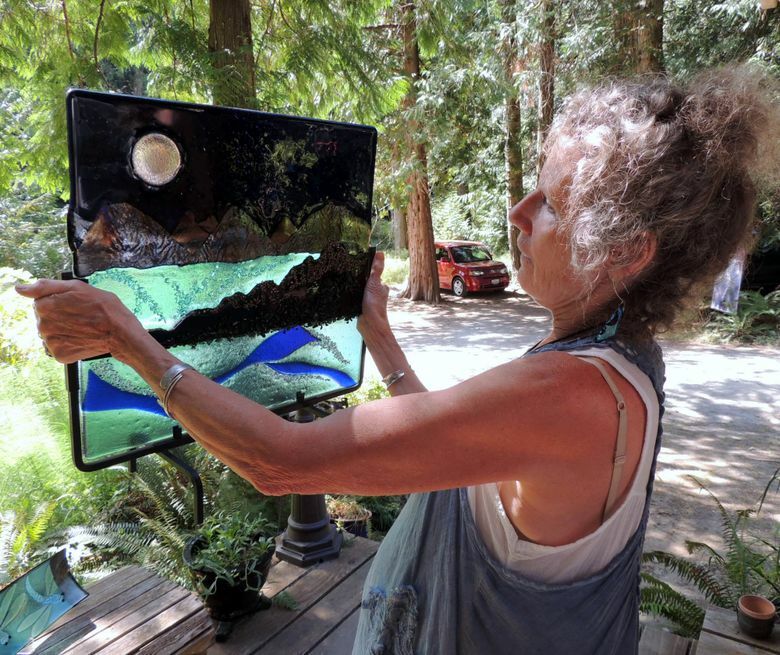 Drawing inspiration from her daily walks with her dog along Pebble Beach, Dolph incorporates shells and leaves in some of the pieces she displays in her open-air Cedar Grove Gallery. Devicque shows off her colorful mobiles and bird feeders in a garden populated with hummingbirds and hundreds of tiny frogs. Sheltered Montague Harbour is the gateway to Montague Harbour Marine Provincial Park as well as Gray Peninsula, home to First Nations people before the arrival of the island’s namesake, Spanish explorer Dionisio Galiano, in 1792. A loop trail is an easy hour’s walk through the forest and along white shell beaches. Locals say it’s one of the best places to watch the sunset. A few miles away is the Hummingbird Pub, an island institution popular with families. We could have easily driven, but instead we parked the car at the marina and waited for Tom Tompkins (aka Tommy Transit) to show up behind the wheel of the free Hummingbird Pub Bus. 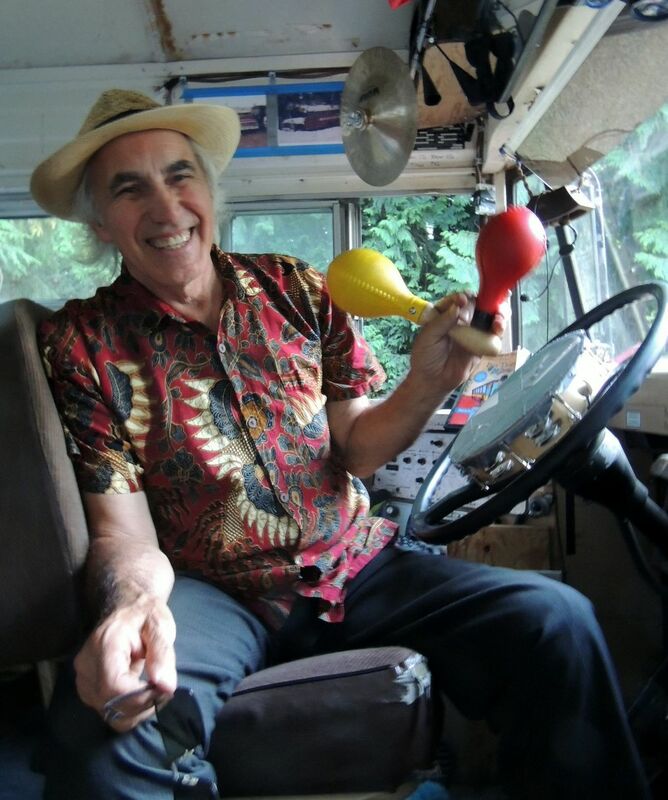 Suddenly we’re all back in high school as Tompkins, 71, hands out maracas and tambourines, cranks up the music and bangs on cymbals and a cow bell mounted above the dashboard. Burgers and beer aside, it’s possible to find Indonesian, German (served from the same food truck) and Thai food on Galiano. The award for most creative use of local ingredients goes to Pilgrimme, where chef Jesse McCleery composes dishes from food mostly foraged, grown or produced on the island. 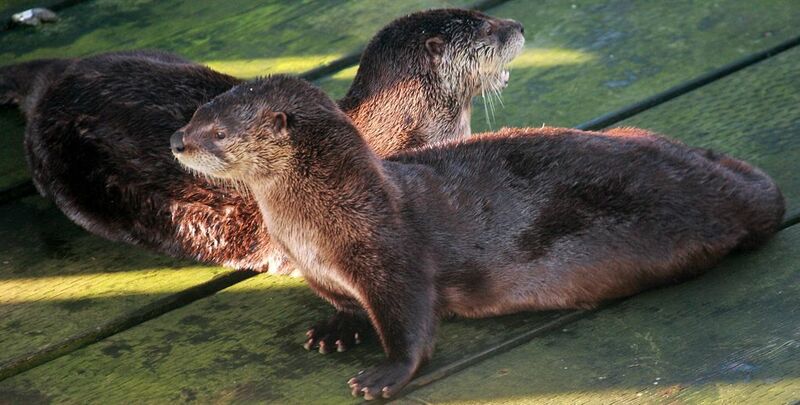 Relaxing on the deck of his cottage-like restaurant in the woods one evening, we sampled our way through four or five shared plates including a bowl of marinated olives tossed with chopped pine needles, herbs and chilies and a salad of roasted peaches, local greens and blue cheese. Close to the ferry terminal on the south end of the island is Bluffs Park, Galiano’s oldest wilderness park, overlooking Active Pass. 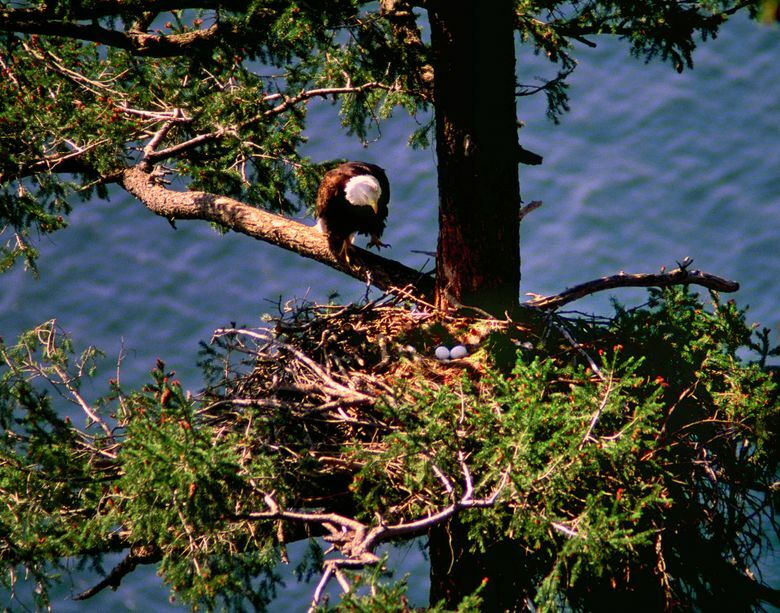 Galiano is on one of the main feeding routes for orca whales and the best viewing spots are near here. A detour through the Galiano Cemetery took us along a path marked “Whale Trail” and down a flight of concrete steps (No. 17 on the map) to a sand beach with a long view up the pass. We didn’t spot any whales while we were there but we weren’t disappointed. 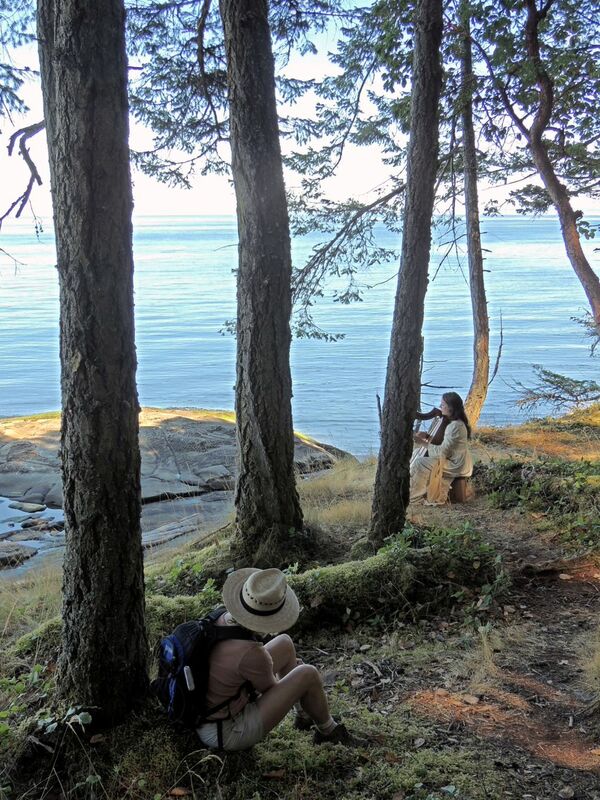 Serendipity kicked in once more when we noticed a flier advertising the Galiano Conservancy Association’s “Musical Walkalong for Learning,” an annual, three-hour guided walk through the forest accompanied by musicians playing flute, cello, horns and more. Whales I’ve seen before but never have I hiked through the woods and come upon a bass player standing in a clearing, or a harpist perched on a bluff above a crystal blue bay. 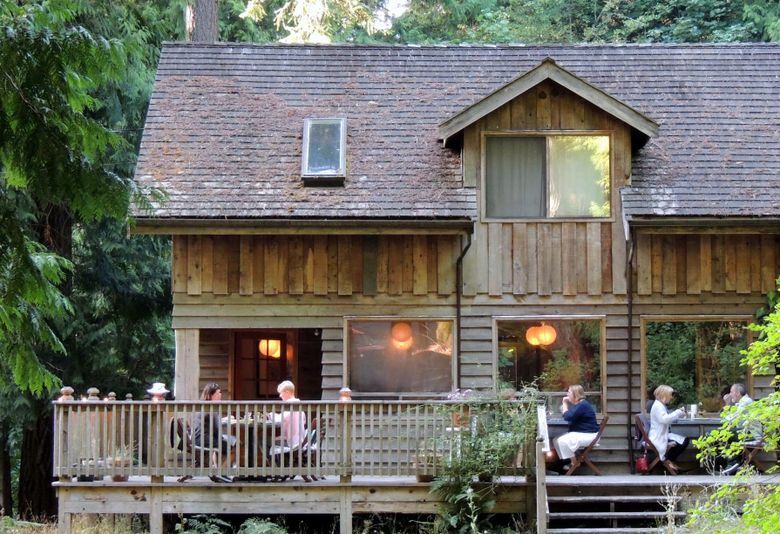 Tourist season on Galiano Island winds down after Canadian Thanksgiving (Oct. 9 this year). Some businesses close or keep seasonal hours. Best to call ahead if you have a specific restaurant or art gallery in mind for a visit. Year-round activities include golf, kayaking, biking and hiking. From Seattle, follow Interstate 5 north to the Canadian border. Take Exit 26 from B.C.’s Highway 99 North, and merge onto Highway 17 to the Tsawwassen ferry terminal. See bcferries.com for schedules and prices. (Be prepared for sticker shock compared with Washington State Ferries; regular round-trip fare for car and two passengers is about $185 U.S.) Travel time is 55 minutes. Reservations recommended. With no regular public transportation, Galiano is best explored with a car or, if you don’t mind hills and narrow roads, by bike. • Galiano Adventures (galianoadventures.com) rents mopeds May-September. 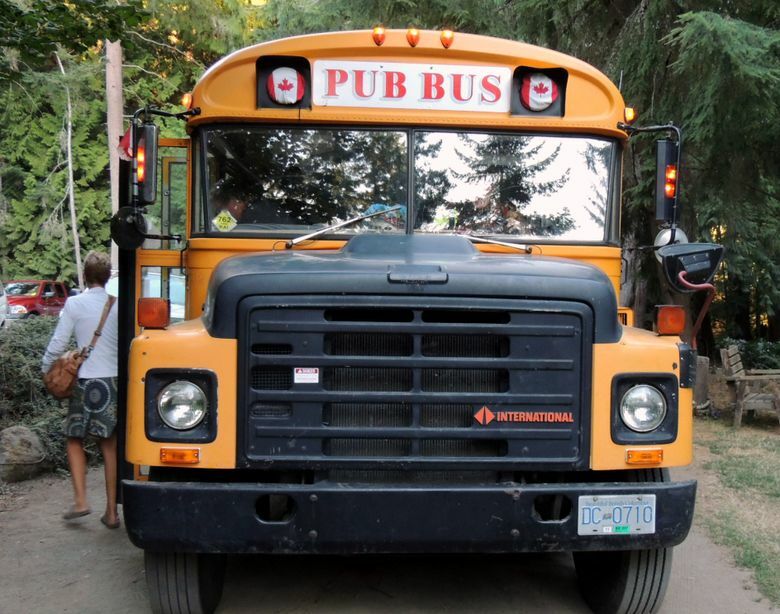 • The free Hummingbird Pub bus runs from Montague Harbour Marina and the park campground to the pub and back from the end of May through the last Saturday in September. See hummingbirdpub.com/news/bus-schedule. Cabins, bed-and-breakfasts, Airbnbs and campsites are available in various price ranges. We paid $108 (U.S.) per night for our Airbnb, a small cottage with a kitchen and private bath on the south end of the island near the ferry dock. Looking for a splurge? 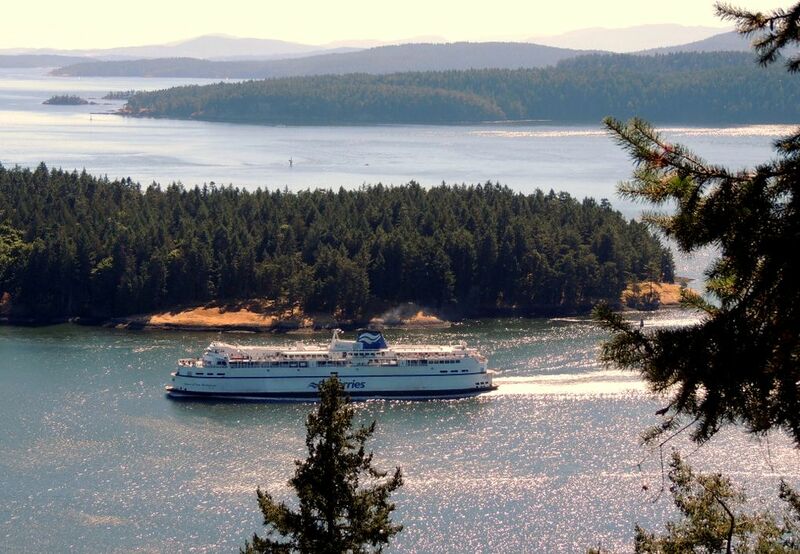 Within walking distance of the ferry dock is the Galiano Inn. Fall rates on oceanfront spa and villa suites range from $199-$299 Canadian ($163-$245 U.S. based on the current exchange rate). The hotel provides Smart Cars for guests; galianoinn.com. • Find local artists and farmers at the Galiano Saturday Market, from late May through Oct. 7, 10 a.m.-2 p.m. See galianoisland.com/galiano-saturday-market. • The island’s annual Blackberry Festival is Oct. 7. 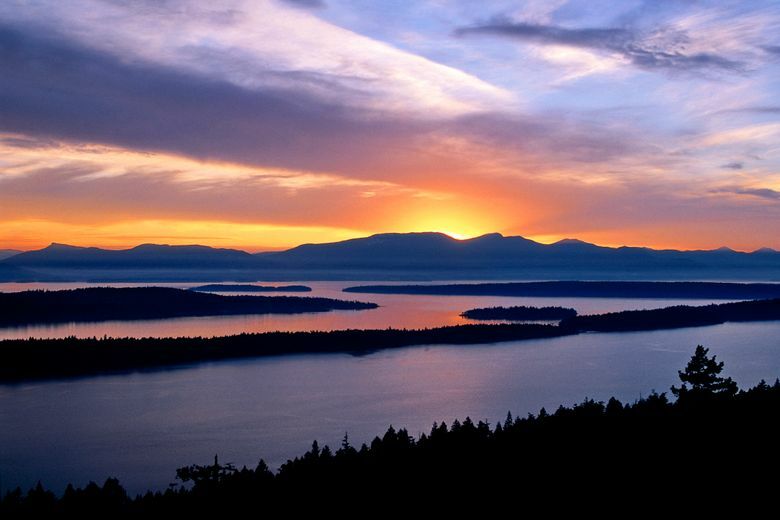 • Galiano’s annual Literary Festival is next Feb. 23-25, hosted by the Galiano Island Bookstore; galianoislandbooks.com. • Continuing through May is the Galiano Concert Society’s 2017-2018 Baroque and Beyond series; facebook.com/GalianoConcertSociety. 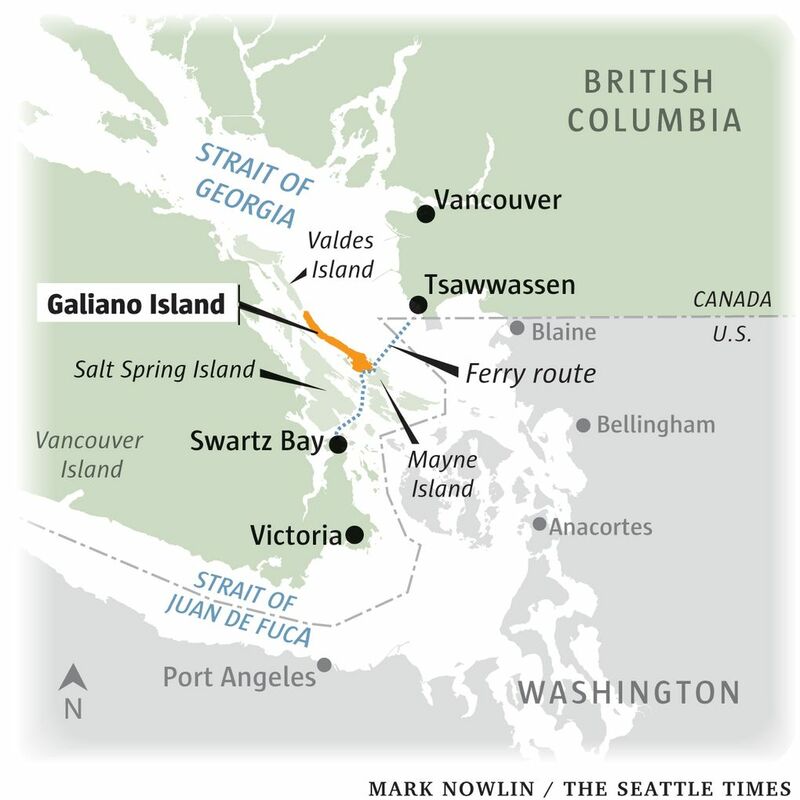 • Pick up maps at the Galiano Island Chamber of Commerce information booth on Sturdies Bay Road, near the ferry dock. • More trail information on the Galiano Trail Society’s website: galiander.ca/galianotrails. Carol Pucci is a Seattle travel writer with a blog at www.travel.carolpucci.com.